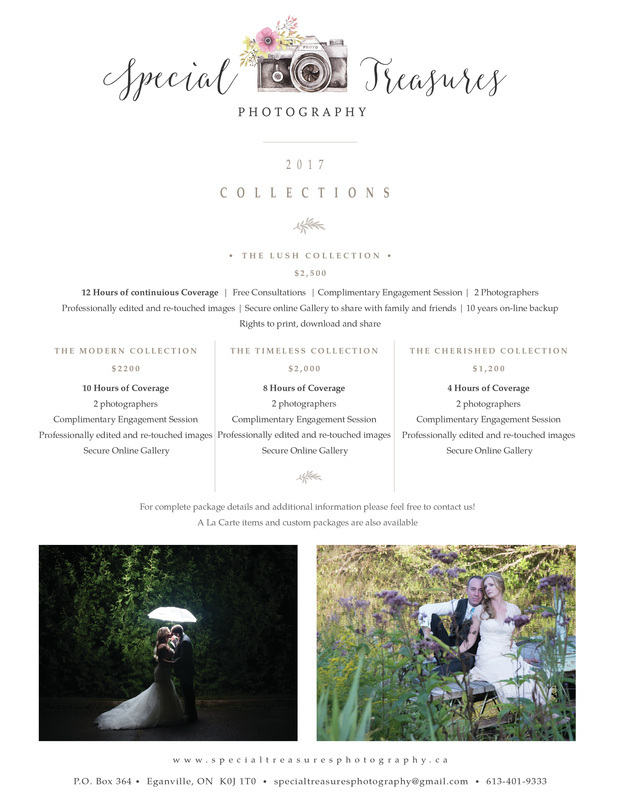 At Special Treasures we can provide you with something even more special, two photographers to capture your special day. Every wedding package comes with two photographers, this way we will capture even more moments that will become Special Treasures. We offer packages to suit every budget and can create custom packages to suit your needs. This is a perfect package for the couple that is looking for full day coverage from getting ready to the bouquet toss and everything that happens in between. The Modern package offers almost full day coverage from getting ready to the first dance and is our most popular package. For those who need a little less coverage but still want to capture most of the story of the day. This coverage is flexible and can include getting ready until formal portraits, or if the reception is more important we can arrive later and capture less getting ready and more of the party! This package is perfectly suited for a couple that would only like ceremony and formals. Formals include family, bridal party and couples portraits. A free Engagement Session. Approximately 1 hour at a location of your choice. Includes a PASS gallery and your choice of 10 fully edited high resolution images of your choice to download. The engagement session is offered as a free gift to give us a chance to work together before your big day it helps couples feel more comfortable in front of the camera it has no cash value is not transferable. There is no discount or refund if you choose not to have your engagement session.